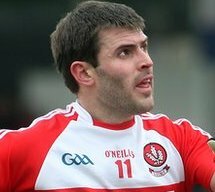 Derry GAA confirms Mark Lynch has retired from intercounty football. A spokesman for Derry GAA said: “When Mark Lynch arrived on the football scene it was clear that he was a young player with immense potential. “An All-Ireland minor winner in 2002 at 16 years-of-age, Mark was always an exceptional player. His progression from minor to senior ranks was testament to this with Mickey Moran handing him his senior debut in 2004. “If you say the name Mark Lynch people across county Derry would maybe say: strong, powerful, natural, versatile, accurate, intelligent, modest, dedicated, team player, and leader. Every single description is correct. “Mark Lynch always stood up, never stepped back, and always made an impact on the pitch no matter where he played. Any team with Mark in it was the better for it. “Mark is more than just a quality footballer, he is an honest, genuine person who has given many years service to Derry and for that we are forever grateful. Speaking about his retirement Mark Lynch said: “As someone who grew up wanting to represent my club and county, I feel privileged that I got the chance to do both. “But there is a time for everything and with current family and work commitments, now feels like the right time for me to retire from county football and devote those extra energies to other areas of my life. “I thank my family, club, all the players, coaches, managers, and support teams who have made my county career possible. “Playing for Derry was something I always enjoyed and it breaks my heart to think I won’t do it again. For me there was always a real buzz wearing the red and white and representing my county, my club and my community. “Mark Lynch is a class act who has given unstinting service to Derry football for many years. He was a manager’s dream and a role model who made a real positive impact on all the players around him.